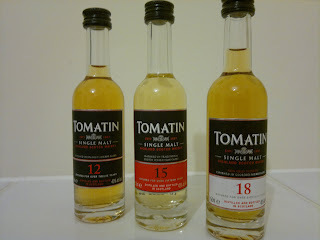 After enjoying the 12 Year Old Tomatin this slightly older brother is somewhat of a disappointment. Normally you see 12 year releases followed by 18 year and I suppose that’s for a good reason; to allow maturation and distinction to occur. Here, if feels like Tomatin had an excess of pending 15 year casks and wanted to do something radical to offer a different taste. In that respect, they’ve succeeded but it’s not an enjoyable whisky in my opinion. Light and fresh, with delicate oaky notes. Fruit follows with citrus, flavours dominating, vanilla and orange peel linger in the background. Soft, gentle and very fruity. Smooth, medium body, delicate honey and apricot. This has been matured in traditional Scotch whisky oak casks which provides it with its light colour and lingering finish. It’s a personal preference but the finish here is too strong and too unpleasant for my taste. Almost metallic in bite this is not for me.